Most of us have heard of complementary colours, but what are they, and how can we make the most of them in our paintings, whether we paint in watercolour, pastel, oils, acrylics or perhaps a mixture of sand and sheep droppings? Complementary colours are those that stand precisely opposite each other on the colour wheel, such as red and green; blue and orange or yellow and purple. One of the most exciting ways of exploiting this is to juxtapose the complementaries as shown above. 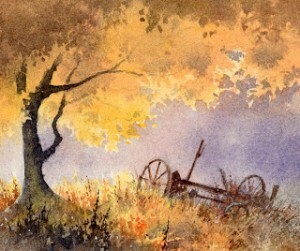 In this watercolour showing part of the composition the autumn tints of warm yellow and orange come directly up against the warm blue of the background. Being complementary colours they are extremely effective in creating an attractive and dramatic colour relationship. This effect can be accentuated or reduced by intensifying or reducing the colour strength. Note also that away from the blue background the colours are closer related – analogous colours that will be found within a small segment of the colour wheel. This suggests a calmer feeling, and an interesting foil to the more dramatic juxtapositioning of the complementaries. This painting is reproduced in my Skies, Light & Atmosphere book, which is aimed at artists who wish to put a little extra into their landscape painting, and you can find details of a special offer in our shop. Our new website is almost ready to run, and we apologise to those of you who have had problems accessing the old one which is starting to creak a little. This entry was posted in atmosphere, complimentary colours, David Bellamy by David Bellamy. Bookmark the permalink.